A successful New York sculptor returns to her Texas home to reconnect with her family, only to encounter old patterns of miscommunication and jealously. From her emotionally distant father and her fiercely competitive mother to her sister and sister's husband who blames everyone else for their own sacrifices, it becomes clear that everyone is an outsider in this complex family. A sensitively handled drama about a family whose less-than-happy reunion reveals no end of bitter divisions... kept from becoming too oppressive by Bass' restrained approach... the fine cast resists the potential for easy pathos, villainy and melodrama... Each principal thesp grasps their role with such subtle, layered understanding. It's hot as Texas in July --- in fact, it is Texas in July --- but the emotional climate is well below freezing in writer-director Hyatt Bass' debut feature. 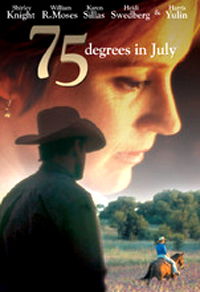 A sensitively handled drama about a family whose less-than-happy reunion reveals no end of bitter divisions, "75 Degrees in July" is the kind of sober, downbeat chamber drama that reps a hard sell theatrically these days, particularly without benefit of significant star wattage. Prospects will probably be brighter ahead in broadcast and video markets. Title's weather forecast appears to be wishful thinking, since characters are wilting from the heat throughout. This adds to the general crankiness as Letty Anderson (Karen Sillas) returns home --- for evidently the first time in several years --- to visit her parents and sister. The excuse for this trip is a posh local gallery show of her sculptures; Letty's artistic career has brought her considerable success and prestige. But sibling Kay (Heidi Swedberg) can only view this success through the tunnel vision of her own resentment --- she'd abandoned a promising singing career years before, ostensibly to raise a family, but more deeply due to her mother Jo Beth's (Shirley Knight) meticulous undermining of any professional confidence. She's taken that frustration out on husband Jed (William Moses), never letting him forget he's her father Rick's (Harris Yulin) employee. 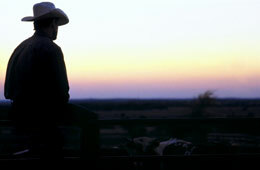 Nor can Jed stop resenting the wealthy Anderson patriarch's purchasing his beloved but debt-hobbled ranch, making him a hired hand on his own one-time family property. Indeed, this clan is all about competition, emotional blackmail and little backstabbings, a status quo set in stone long ago by the parents' needy, manipulative ways. Jo Beth is the type of butter-wouldn't-melt hausfrau whose surface sweetness masks a constant, nagging disapproval. (She tactlessly implies that still-single Letty's career triumphs are meaningless alongside her domestic "failure" as an "old maid.") She longs for some show of tenderness from hubby Rick, but his meanspirited neglect amplifies her shrewishness, just as the cold-blooded business strategizing that's made his fortune has also played wife, daughters and son-in-law against one another. Letty and Jed --- once high school sweethearts until he was grabbed away by Kay, presumably in another show of premeditated one-upmanship --- appear the least vindictive characters here, the ones most willing to forgive and forget. It's a bleak psychological landscape, kept from becoming too oppressive by the physical one (lenser Michael Barrett makes much of the rural scenic beauties at hand) and by Bass' restrained approach. There are few explosive confrontations here; instead, interpersonal tensions are revealed in small, incessant slights and telltale glances. 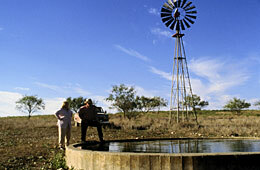 The widest open spaces in "75 Degrees" aren't Texas' own, but rather the yawning gaps between what's said and what's left to fester in silence. While pic's modesty precludes the greater cathartic punch of similar deep-freeze-family dysfunction dramas from "Ordinary People" to "The Ice Storm," its earnestness and integrity make these rather unpleasant characters watchable. So, too, does the fine cast, which resists the potential for easy pathos, villainy and melodrama. Feature might have degenerated into a feel-bad domestic potboiler if each principal thesp didn't grasp their role with such subtle, layered understanding. Bass might have allowed them to lighten up a little more often, though: Apart from one very funny, incisive scene in which the Andersons scare off a highway patrolman, there's not much humor here to alleviate the overall gloom.